The More children and their mother lived at Larden Hall (in Shipton, near Much Wenlock, Shropshire), a 16th century timber-framed house with a 1607 stone extension and further extensions in Victorian times. It was demolished in 1969 and replaced with a brick-built house. Katharine More’s husband, cousin Samuel, came from Linley Hall, near Bishop’s Castle, Shrophire. Linley was also a timber-framed house but was remodelled in the Palladian style in 1743 -8. We haven’t yet found a print of the original building. The More children were removed from the privileged home of minor gentry at Larden and sent for a temporary stay with tenants of the Mores of Linley before being subjected to the crowded, uncomfortable and insanitary conditions on the cargo ship, Mayflower, where three of them died (along with half of the other passengers). The one survivor of the four children was six-year-old Richard who then had to adjust to life in a small log cabin in another continent. The contrasts couldn’t have been much greater for Richard: a large timber-framed and stone-built country house with servants in Shropshire versus a small, timber-built cabin in America with the Brewster family and their two children. 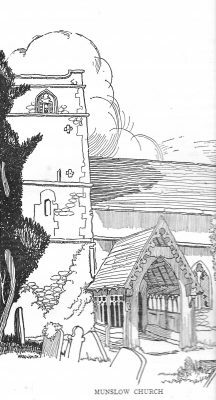 The More children’s story reminds us of the existence of many interesting historic buildings, particularly in the south of Shropshire where the land was better than the north of Wenlock Edge for farming. Oak trees and building stone were readily available and families who were doing well from their lands or from their jobs as lawyers, sought to build exemplar houses. Simon Jenkins’ famous book, “England’s Thousand Best Houses” lists 26 notable country houses in Shropshire. The majority of these are in the south of the county. Acton Burnell (north-east of Church Stretton): 13th century fortified castle with a nearby house, now a school, much changed over many years. Clun: Trinity Hospital: a quadrangle of almshouses built for poor shepherds in 1618.
the Castle; built in 1086 to keep the Welsh at bay; then the headquarters of the Council of the Marches; now owned by the Earls of Powis. Castle Lodge: possibly built by the Palmers’ Guild and at times a school and a hotel; famous for its Elizabethan panelling in most rooms. Recently sold. No contact information. Dinham House: Georgian with five bays, now a showroom for wood-burning stoves. Feathers Hotel: black and white timber, rebuilt by its lawyer owner in 1619 with jetties overhanging the street and a richly carved façade; now a hotel and under new ownership. Mawley Hall (south-east of cleobury Mortimer): early Georgian, built in 1728 with plasterwork, carpentry and marquetry of note. Shipton Hall (Shipton, near Much Wenlock): stone-built manor house of 1587; owned by the Shropshire Mytton family when a daughter was locked in her room to prevent her marriage. Her pitiful note etched on a window in 1792 remains on view. Open occasionally for group bookings. Stokesay Castle (between Craven Arms and Ludlow on the A49): a fortified manor house, built in 1281; a superb 1640s gatehouse; all carefully restored and in the ownership of English Heritage. Upton Cressett Hall (west of Bridgnorth): the Cressett family owned this manor from Conquest times; an Elizabethan gatehouse and 14th and 16th century features in the main house, plus impressive chimneys; when Samuel More was captured and then paroled, he was offered freedom in exchange for the Royalist prisoner, Edward Cressett. Samuel was sent to live at Cressett Hall where he was required to stay until Edward Cressett was released by his captors. Mostly used as a wedding venue. No visitor details on website. The Iron Bridge (on the edge of Telford): the first bridge built of cast iron in the world (1781), recently refurbished in its original red paint. The Flaxmill Maltings (Shrewsbury): the first steel-framed building in the world (1797) and forerunner of all skyscrapers, recently refurbished. The White House (Aston Munslow): the timber-framed half dates from the 14th century with modifications in the 18th Now a holiday let run by the Landmark Trust with occasional open days. Millichope Park (Munslow): a 19th century house (much admired by Pevsner) set in spacious grounds that are often open under the National Gardens Scheme. The earlier house was probably from 16th century and had been built by a branch of the More family. We would be delighted to hear from companies that they will be arranging tours of some of these buildings in 2020.